FRAMINGHAM, Mass.--(BUSINESS WIRE)--Jun. 10, 2014-- Staples, Inc. (NASDAQ: SPLS) and Teen Vogue, the number one source of fashion, beauty, and pop-culture news for trendsetting teens, today announced a partnership to make more classroom style happen this back-to-school season with an exclusive product collection. Beginning in July, Staples stores nationwide and Staples.com will be stocked with unique Teen Vogue products, including exclusive Staples BETTER® binders, notebooks, folders, pencil pouches, pencils, pens, compact staplers, lipstick and other die-cut erasers, sticky notes, clipboards, and more that make it easy for students to show their style and keep up with the latest trends. Staples will also be the official school-supplies destination for Teen Vogue’s annual Back-to-School Saturdays initiative. The Staples brand product team and Teen Vogue editors worked together to create an exclusive collection of back-to-school supplies inspired by runway trends for 2014. The result is an authentic, fashionable, and functional collection perfect for any scene-stealing teen. The Teen Vogue collection, exclusively at Staples, includes a wide assortment of products in four distinct style families. Oversized animal prints in explosive colors are the theme in Electric Jungle patterns. Reinterpreted cheetah and giraffe prints mixed with metallics will make a bright splash in lockers. Punk Prodigy patterns showcase the attitude and rebellion of a fashion revolution. With graphic plaids, skull patterns, and medallions, the Punk Prodigy trend will make a statement in classrooms. These fun and full-of-life patterns offer a contemporary twist to classic Parisian feminine dressing. From oversized polka dots and hearts to bright candy colors, the Rive Gauche trend will bring an optimistic style to school hallways. Soft colors and tiny floral prints show off a sweeter side. 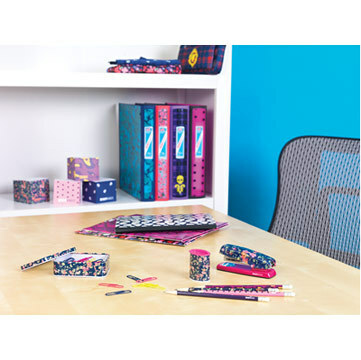 Mixed and matched floral patterns will bring a flirty sophistication to students’ school supplies. Visit http://www.staples.com/teenvogue for more information. Media can visit http://www.staples.com/btspr for more news and photos throughout the season. Teen Vogue, a Condé Nast publication, a division of Advance Publications, which operates in 25 countries, is the number one source of fashion and beauty news for style-conscious teens and 20-somethings everywhere. In the United States, Condé Nast publishes 18 consumer magazines, two trade publications, and 27 websites that garner international acclaim and unparalleled consumer engagement. The Teen Vogue brand brings the sophistication and authority of Vogue to a new generation of savvy young women who desire to be on the cutting edge of fashion, beauty, and culture. Launched in February 2003, Teen Vogue publishes 10 issues a year and has a circulation of more than 1,000,000 readers.